Preheat your oven to 300 degrees F.In your stand mixer (with paddle attachment) or a large bowl, mix together the blanched almond flour and baking powder. Add in all the other ingredients (syrup, vanilla, salt & vanilla stevia) and mix until combined. If you choose to not use the stevia, taste the dough to test the sweetness. If you don't find it sweet enough, add a bit more sweetener.If you're using a stand mixer, put it on medium to high speed and after about 20 seconds, you'll start to see the dough come together. When it forms into a big ball, turn the machine off.If you don't use a stand mixer, knead the dough on your counter for about a minute. It will be super crumbly at first and will look like it may not come together, but it will. Keep kneading and it will form into a ball.Once your dough is in ball form...place it between 2 sheets of parchment paper to roll out. The dough is very pliable and easy to roll. Roll to a thickness you like, and cut out your shapes with cookie cutters. I used various sizes, so the nutrition may be off depending on the size of cutters you use. Bake cookies on a cookie sheet lined with parchment paper. You will need to watch them closely, as cooking time depends on the thickness of the dough. If its thick, it will take longer, if its thinner, it will cook much faster.Mine baked for 19 minutes until they were perfect. As soon as they start to get golden around the edges, they are done.I suggest setting your timer for 15 minutes, then watching from there, checking every minute or so.Cool completely and top with frosting if desired. 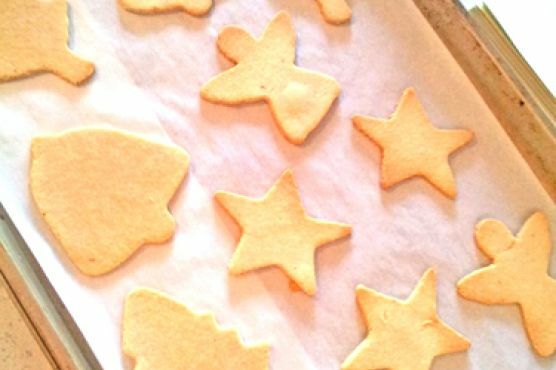 Sugar Cookies can be paired with Cream Sherry, Madeira, and Moscato d'Asti. A common wine pairing rule is to make sure your wine is sweeter than your food. Delicate desserts go well with Moscato d'Asti, nutty desserts with cream sherry, and caramel or chocolate desserts pair well with port.